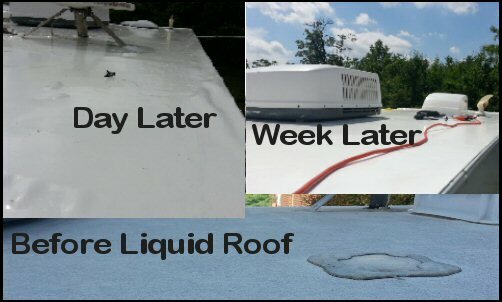 Wanted to give an update a week after our application of Liquid RV Roof. Our aches and pains are just about subsided. The roof is nicely sealed and bonded to the old roof. This shot above was while taking off our MaxxAir Covers. You can see the gray or ashen color of the roof. It didn't have cracks or rips, but it felt thin and chalky when you ran your hand over it. 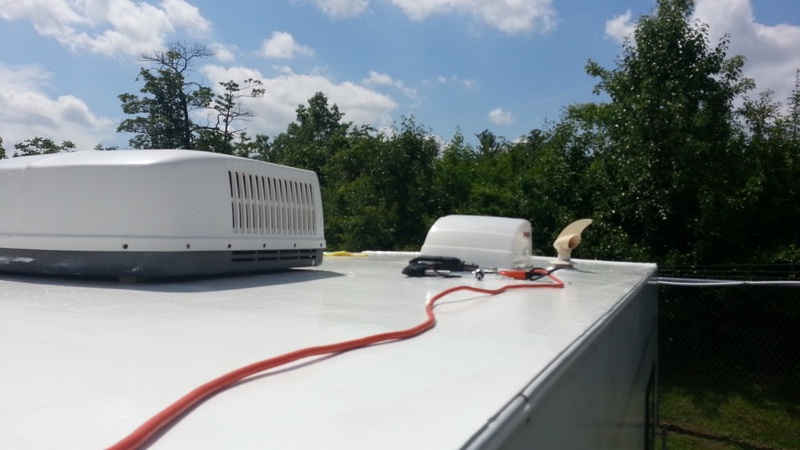 The picture above shows how the roof looked the day after application. 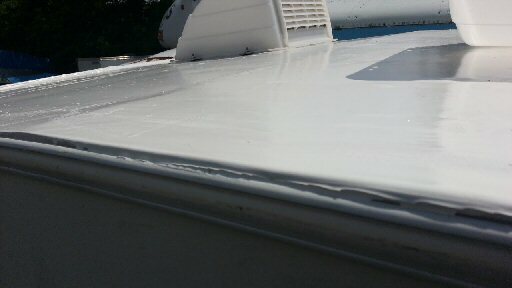 The roof is smoother and shiny now. Notice there are what look like wrinkles or bubbles on the new roof. The week after when we visited to put the Maxx-Air Vent covers back on - they were almost all gone. 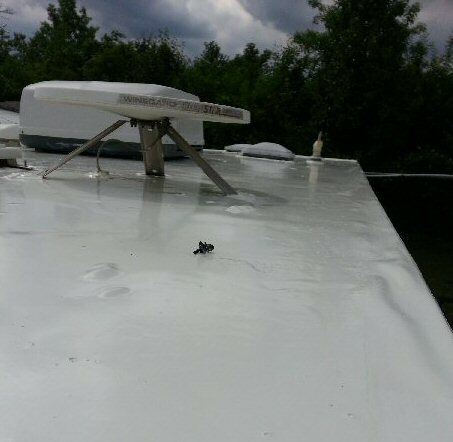 According to our reading this is a normal occurrence when applying Liquid Roof. I did find a small bubble while Amy was putting the vent covers on, and decided to gently press it down - as Amy scolded me for doing so. It went down and stayed down and seemed pretty solid. Pretty confident the roof will be holding up well. Oh yeah - that black thing you see in almost the middle of the photo? A grasshopper or locust decided to get stuck. 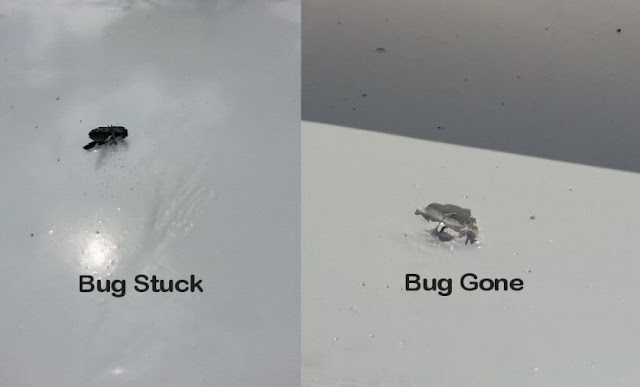 The bug pretty much fell apart a week later. As Amy put the vent covers back on, we noticed we can still smell the roof (it has a particular "new rubber" smell), so it is still curing. I took another photo as Amy was working on the MaxX-Air covers. You can see there are no bubbles now in the new roof, so the roof seems to be adhering to the old material well - as we had read it would, and had hoped. Roof Edge and look - no bubbles! The only area I am not satisfied with is a section along the driver side edge of the roof. Really nothing wrong with it - except I can see some of the old roof right on the edge. This might be because we pulled the painters tape off early. Later in the camping season I'm considering using some dicor lap sealant along that edge just to make sure we are sealing the old roof material as best as we possibly can. Any questions or comments, let us know! Safe Travels - hope to see you camping or on the road! Great Job on your roof. I did my 1995 31 ft class C in Sept 2016- I'm 66 and in Texas, heat was not too bad the days I worked on it. I did mine over 5 days. Removing all vent covers & A/C cover removing loose calk Cleaning with a pressure washer for day one-The roof had been coated with an unknown product that was crack and coming loose. I used a Dual Action type air sander and sanded the entire roof to remove all previous unknown coatings being careful to not burn thru or tear into the rubber roof and then pressure washed one last time. This was day 2 & 3. After over night dry I taped off sides as you did with 2" painters tape. I did do a wipe down with acetone before I started with trim out. I had purchased a 1 gal container for trim out. I used a 3" brush and the entire gal on vents down both side and front and rear cap. This was done on day 4- I started early on day 5 and mixed and applied from a 4 gal container using the same method you did but using a cheep Walmart 9" spreader and followed with a roller with long handle. Had wrinkles just as you did next day but they all went away in about a week. 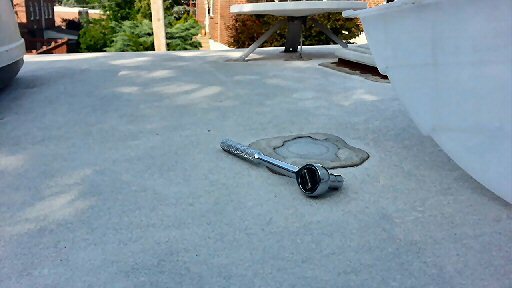 I did come down over the edge on both side half way over the gutter that was taped off mid way. I let the tape stay on until the next day and removed it with no problems. I had a bug or two as well land in a couple of places and purchased a qt to repair those few areas. Repair was easy and I have no leaks or problems. So far so good. Cost much less than a new membrane.